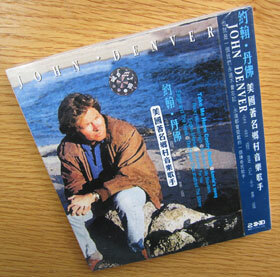 You can win a free copy of a John Denver Greatest Hits CD – with Chinese packaging!! To win, all you need to do is simply comment on this post. Yes, it’s that easy. No tweet my blog, join my Facebook page, sell me your first-born child stuff. The lucky winner will be randomly chosen at 6 pm mountain time, on Thursday, April 14th. I’ll announce the winner on this blog post. (I’ll also contact them by email.) Sadly, I cannot ship outside the USA, as I’m too crazy-busy to make a special trip to the post office. The winner, picked unseen out of a salad bowl by my daughter Rachel, is Carl Irby! Congrats, Carl!! The CD will be headed your way in tomorrow’s mail. And special thanks to Elizabeth, who provided the inspiration for this post. On the PBS John Denver show, I learned that Mao was a big fan of his. John Denver got airplay in China long before other Western artists. I don’t know if he got any royalties there. I doubt it. I hitchhiked back to Aspen from my construction job with a carpenter who was working on John’s house. There were curved pieces of wood on the floor of the jeep from a curved door in their bedroom, which had a wavy wall complete with a wavy stainglass window. In 1982, there was a girl who hung out with the project who had gone to Denver specifically because she had a mad crush on John Denver. She sneaked into his gated community so she could look at his house. I don’t think she ever met him. if and when I win, you don’t have to ship the CD to Belgium, just bring it with you if you happen to come by. John Denver had another thing with eastern culture; he ate Macrobiotic… Japanese idea. John Denver holds a special place in my music collection. Sweet Surrender remains my favourite. As for being outside of the USA, oh well, someone else can win. I meant the girl had gone to Aspen. Duh. My freshman year I majored in Architecture. This brings back memories of Architecture Communications (aka drawing) classes where a fellow student played “Back Home Again” on cassette tape while we were drawing–this was 1974, OK? Previous students had carved encouraging epithets such as: “Get out of architecture before architecture gets you!” as well as “John Denver was here.” He was an architecture major at Tech before his music career. in honor of this contest, I am singing “You Fill Up My Senses” — right now! John Denver is the exactly the perfect example of the type of artist who just made music that he loved and was just who he wanted to be… and as a result, had a HUGE following. It went out in today’s mail!